LOOK for patterns, prints and a return of the 1970s this fall, says Kevin Heck, the owner of the Seagrass Boutique at 409 E. 8th Street. And bare shoulders. But more on that later. 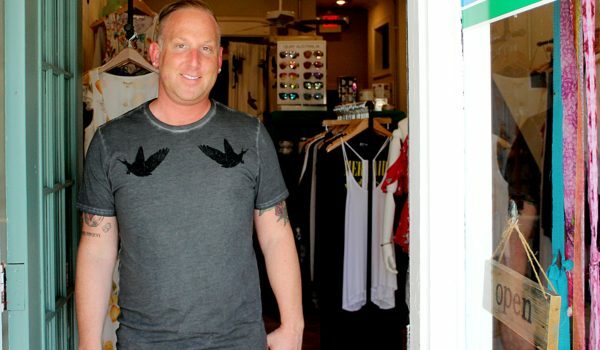 Kevin spent his career in women’s retail, and with his husband and business partner, Justin Adams, owns and runs what’s been called one of the hottest women’s boutiques to hit South Jersey in a long time. He recently talked about trends for this fall, and what brought him back to his local roots. About five years ago, what he described as a “family situation” brought him back from Mason, Ohio, where he oversaw indoor display and window display for Sunglass Hut locations across America. He had lived and worked around the country before returning to Atlantic County. After extensive research and a lot of work on the design and look, the first Seagrass Boutique opened at 1055 Shore Road in Linwood in the spring of 2016, and the new Ocean City store followed in time for the summer of ’17. Through the hot months, the store focused on casual and beachwear, but he plans to dress it up some for the fall. Kevin grew up in Somers Point, and worked on the Ocean City Boardwalk through high school and college. In college, he majored in PR and journalism before getting a degree in fashion marketing from the Art Institute of Philadelphia, one he said he didn’t really use. He learned a lot more working for H&M in New York. Ocean City has seen a change in the downtown. There have always been fashionable women’s shops along Asbury Avenue, but he sees an expansion in the number and quality of the stores. That’s why he wanted to open on the island. The feel in the Ocean City Seagrass Boutique is similar to the Linwood location, but it’s not exactly the same. As the weather cools, and the beaches start to empty, the look will change. Fall will bring a lot of color this year, Kevin said, especially blush, olive green and rusty orange. And you’ll continue to see a lot of bare shoulders, what he described as the cold shoulder look. He expects lots of floral patterns, like the dress modeled by Crystal Dawley for this story, but also other prints like circles, dots or stripes. In fashion, everything gets recycled, Kevin said, although he at first wasn’t sure if this year looked more like the 1970s,’80s or ’90s. “I feel like denim is throwing back to the ’70s. You have the hi-los, and flares are coming back,” he said. Then he thought of Free People’s line for this fall, which includes a lot of shiny, metallic material and decided the ‘70s vibe was the best description. There’s a process by which the looks dreamed up by the big designers filters from a Paris catwalk to a party in Ocean City. But the designers also look to what people actually end up wearing. Kevin said there’s always room for personal taste. On the mainland, customers begin looking for the fall look earlier, but he plans to transition the Ocean City shop in September. On the store’s website, the owners promise current fashion, sought-after brands, and timeless pieces. “Whether you’re a free-spirited wanderer, a present-day bohemian, a woman who embraces luxury and elegance or someone who prefers simplicity as its finest, our fashion collection allows you to make a statement – all while being comfortable.